Since the introduction XAML applications (WFP, Silverlight) and continuing with Windows 8 Metro-style Apps, a Universal Windows Platform App (UWP) takes advantage of the Model-View-ViewModel (MVVM) pattern to distribute the responsibilities of an app to different classes or layers. In this post, I will walk you through implementing view model-based navigation in a UWP App, instead of the more intuitive Page-based navigation. In order to make the explanation more complete, I will not make use of any framework for this post. In a later post, I will refactor the code in order to take advantage of one of many frameworks that include MVVM helpers. First, follow the steps in the previous post to build a Hamburger Menu application. Create a couple of additional pages, MainPage.xaml and OtherPage.xaml. Remember that the Hamburger Menu is implemented using RadioButton controls. Notice that the application currently uses the traditional Page-based navigation technique, reacting to event handler in the code-behind. One key benefit of view models is that they can help remove most of the code-behind a page. Using two-way databinding instead of wiring events in the code-behind usually lends to a better design. /// Initialize a new instance of the <see cref="MainPageViewModel"/> class with required dependencies. In a real-world program, a view model inherits from a common base class that provides helpers for property notifications. Please, note that, for this post, I’m not using any framework so that everything is made clear at the cost of a slightly longer post :-). A good practice to follow when building a UWP application is to abstract away most features behind an interface to some kind of “service”. So, we will create a simple INavigationService and its corresponding NavigationService implementation. Because we want to abstract as many infrastructure details as possible, we will use simple string identifiers to represent the pages of our application. /// Provides a mechanism to navigate between pages. /// Gets the name of the currently displayed page. /// Navigates to the specified page. /// supply additional page-specific parameters. /// Navigates to the previous page in the navigation history. /// The name of the virtual "root" page at the top of the navigation history. /// using the <see cref="NavigationService"/>. The NavigationService class includes the Configure method that is used to associate a simple string identifier to a data type. This method will be called when registering dependencies and implementing the view modelLocator further in this post. You’ll notice that this implementation is using the Page-based navigation that is dependent from the infrastructure on which this application runs. Putting this service behind the INavigationService interface allows to decouple the implementation from the application code. This will make it possible to provide alternate implementations for other platforms, such as iOS or Android using Xamarin, for instance. This represents the top-level frame that is hosted in the Shell’s SplitView pane. This allows to keep the Hamburger Menu on all pages and still navigate between different views. As per this Stack Overflow Question it seems that the default MVVMLigth implementation of the Navigation Service does not work well with Hamburger Menu-based applications such as the one I’m showing here. Fortunately, as we’ve seen, implementing a Navigation Service from scratch is straightforward. ///  A singleton dependency container. /// Gets the default instance of the <see cref="DependencyContainer"/> class. /// Registers a new mapping between the specified types. /// Registers a new mapping between the specified type and the specified instance. /// Returns a registered instance corresponding to the specified type. This code is inspired freely from a sample found here. The bulk of the code is in the Resolve method that uses reflection to dynamically invoke the constructor on types you want to resolve. Mapping between types (usually, from an instance type to an implementing type). Mappings between types and concrete instances. If an instance is already registered for a given type, it is returned directly. If not, the method attempts to find the (instance) type mapped to the specified (interface) type. Using reflection, the method looks up a single constructor and identifies the list of its parameters. If no parameters are required, the method instantiates an object of this type and adds a mapping for subsequent use. If more parameters are required, the method is called recursively to resolve an instance for each required parameter, building a list that is supplied in a call to the constructor. Please, note that this code does not support resolving types with more than one constructor. For a more complete implementation, refer to the aforementioned MVVMLight framework, or use an alternate implementation such as Unity, etc. /// Registers a concrete instance of a particular type to the dependency container. /// Registers a mapping from a specified type to itself to the dependency container. /// Registers a mapping between two specified types to the dependency container. /// Resolves an instance mapped from the specified type. /// Provides access to the view model classes used by this application. /// Initialize a new instance of the <see cref="ViewModelLocator"/> class. /// Gets the <see cref="ApplicationViewModel"/> associated with the <see cref="Shell"/> page. /// Gets the <see cref="MainPageViewModel"/> associated with the <see cref="MainPage"/> page. /// Gets the <see cref="OtherPageViewModel"/> associated with the <see cref="OtherPage"/> page. The primary purpose of this class is to provide access to all view model objects used in this application. Specifically, the three property getters are used via databinding to associated a particular view model objects to its respective page in the XAML DataContext. For the purpose of this post, I have also centralized the registration of all required dependencies in the constructor of the ViewModelLocator class. When an instance of a particular view model object is resolved, the dependency container will resolve its INavigationService dependency. Finally, this class also uses the NavigationService directly to configure a string identifier for each page of the application. Here Application refers to the name of the property in the ViewModelLocator that returns an instance of the appropriate ApplicationViewModel object. /// Represents the ViewModel for the entire application. /// Initialize a new instance of the <see cref="ApplicationViewModel"/> class. /// Gets a value indicating whether the <see cref="MainPage"/> is currently displayed. /// Gets a value indicating whether the <see cref="OtherPage"/> is currently displayed. The MainPageSelected and OtherPageSelected properties are defined as simple booleans to make it easy to databind them to the IsChecked state of the RadioButton controls used in the Hamburger Menu for the navigation. The setters for these properties are used to trigger navigation when the corresponding RadioButton control is selected from the UI. This makes it easy to trigger navigation when a RadioButton is selected. Conversely, when navigation changes the currently displayed page, the state for the corresponding RadioButton controls is updated. Finally, in the Shell.cs file, remove the now unused event handlers. I hope this post makes it easier for beginners to see what’s behind a simple navigation service in a Universal Windows Platform app. In the next posts, I will show how to refactor this code around one of many popular frameworks. I will also show how to record the currently displayed page on exit in order to navigate to the previously displayed page when the application starts. When developing an application, I usually spend a lot of time in the command-line. For this, I use PowerShell, that gives me access to all my scripts that I have built over time. One special need that I have is to perform some commands in the target path of the selected Project in Solution Explorer. For instance, in the product we’re building, that has many dependencies, we are controlling exactly which binding redirects need to be present in our executables’ App.config file. We have built a simple script that processes the contents of a folder and determines from there the exact list of binding redirects that need to be written in the project’s App.config file, along with appropriate comments specifying which dependencies do need these redirects. Therefore, when developing with Visual Studio, I constantly have to drop to PowerShell and change the location of the current workfing folder in order to run my scripts. For this, I use the “Open Folder in Explorer” context-menu command to open Explorer. I then copy the full path to the project and paste that into PowerShell to issue a Set-Location command. Over time, this is cumbersome. 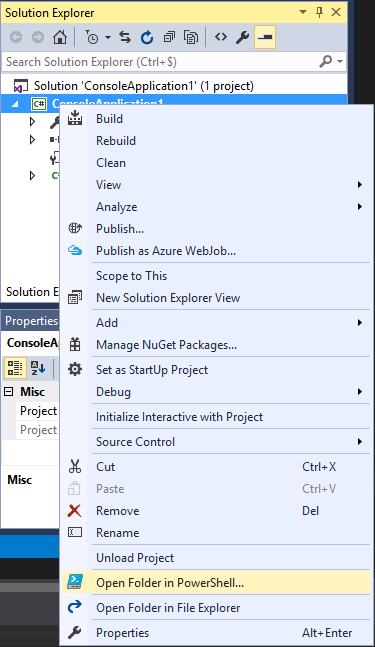 So I set out to build a simple Visual Studio Extension (VSIX) that does exactly that. It allows to open a PowerShell command prompt initialized at the location of the selected Project’s TargetPath. In order to help me build my first Visual Studio Extension, I followed the talk about Visual Studio Extensibility, that Mads Kristensen has given during //Build 2016. This talk walks you through building a Visual Studio Extension, publishing it on GitHub and setting up a continuous integration build on AppVeyor so that new versions can be published in a minimum of time to the official Visual Studio Gallery where extensions live. Of course, this being my first Visual Studio Extension, I still had to figure out how to determine the selected project in Solution Explorer, then how to find its TargetPath and, finally, how to launch a PowerShell prompt initialized with a specific folder. This has been the hardest part for me to solve. Indeed, Visual Studio has many extensibility points and it is not easy to find the correct way to achieve a particular result. Fortunately, many developers have similar needs when building their extensions, so I was able to coble together a working solution from multiple sources. This code uses the IVsMonitorSelection extensibility interface that is used to obtain some informations about the project hierarchy. This code also takes advantage of the TypedObjectForIUnknown helper class that I have written in order to make it easier to consume and dispose of extensibility interfaces around the using statement. Once the full path to the project’s .csproj file has been determined, I figured I could leverage MSBuild to give me its TargetPath, since this information is specified in the project as part of a PropertyGroup. This is the easiest part of building this extension! For this, it is sufficient to run PowerShell with an initial command that performs a Set-Location to the specified folder. However, path can have spaces in them and it is somewhat hard to issue commands with the proper escaping characters for the different layers of processing. In order to make it easier on me, I chose to use the EncodedCommand command-line switch of PowerShell, that allows to specified a command as a Base64 encoded UTF-16 string. In a Universal App, the MessageDialog class is used to display an alert dialog with a set of choices for the user to make. According to the documentation, this class supports up to three commands. var title = "Pending changes"
This all works fine… except on an actual Windows Phone device! In fact, this code crashes on a phone for no apparent reason. I have debugged and could not find a good reason why this code failed. However, I found out that if I only keep two commands for the dialog, the code works all right. So, my conclusion is that the MessageDialog class only supports two commands on a Windows Phone device, as opposed to a Desktop or a Tablet. // use the hardware button for Cancel. The code first builds the dialog box normally, adding commands. Each time a new command is added, it sets the CancelCommandIndex property to the last one. For a Yes, No dialog, the default Cancel behavior would result in the No command being triggered. When both a Yes and a Cancel command are present, the code needs to make a choice. If no hardware button is present – for instance, like on a Desktop – the code proceeds normally. In order to detect a feature, the code uses the ApiInformation.IsTypePresent method with “Windows.Phone.UI.Input.HardwareButtons”, which, as its name suggests, returns whether the device has physical hardware buttons. If a physical hardware back button is present, however, the code does not add the Cancel command. Instead, it sets the CancelCommandIndex property to (uint) -1. This invalid number will make the MessageDialog.ShowAsync() method return null in that case. After the MessageDialog.ShowAsync() method returns, the code checks to see whether the Cancel command was choosen. Since this command was not actually handled by the MessageDialog class itself, the code invokes it directly for consistency purposes. Then it proceeds normally to handle the appropriate branch depending upon the user choice. This code works fine and allows me to build a single App for Desktop and Mobile with the same behavior. However, this code does not produce the absolutely correct behavior when the App is used on a phone but displayed on an external display, such as when taking advantage of the Continuum feature. In that case, I would like the three buttons to be displayed on the dialog box. However, I did not find a solution for this small problem. Please, let me know in the comments if you know or find out how to achieve this. Last time, we saw how to build a simple Hamburger Menu for navigation in a Universal Windows Platform App starting with Windows 10. In this post, I will highlight a few modifications that we need to make in order to enhance the appearance of the menu and in order to properly handle keyboard navigation. A Universal Windows Platform (UWP) App runs on a potentially a large number of devices, including high-end desktop computers. Therefore, it is important to allow the use of the application through proper handling of the keyboard. Many features come built in the controls available in XAML. For instance, using the Space key allows one to press a button. So it works all right with the Hamburger button and the Radio Buttons. In my example, however, I would like the Enter key to be used to select a particular option. And I would like the Arrow keys to be used to select amongst the available options. The code is divided into two parts. The first part handles the Space and Enter key so that it selects the currently selected button. In order to do that, one has to use the RadioButtonAutomationPeer class to programmatically select the associated RadioButton. That way, when you press Enter, the RadioButton is selected and this, in turn, triggers navigation to the appropriate page. The second part of the code handles the Arrow keys and equivalent keys coming from controllers and game pads. This searches for and set the focus to the next focusable element available in the given direction. For instance, if the currently selected option is the Option 1 RadioButton, a press on the Down key will find the Option 2 RadioButton. That way, selecting a given control using the Arrow keys is very simple. In to improve the feedback to the user as to whether a particular control can be selected or pressed, one has to change the color of the control when the mouse hovers above it. Because we already have some styles for the HamburgerButton and the navigation RadioButton controls, it is very easy to add this feature. For instance, the default Button template defines the following Common States such as Normal, PointOver Pressed and Disabled. Likewize, the default RadioButton Template defines the same Common States (because it is also a Button) as well as the following CheckedStates such as Checked, Unchecked and Indeterminate. We are only interested in the PointerOver and Pressed states for the HamburgerButton and the RadioButton controls. One of the first thing to do when building a Universal Windows Platform (UWP) Application is to choose how the application will present its features to the user. The Hamburger Menu is one of the most popular designs for implementing navigation in a universal app. Its use is pervasive across all Microsoft apps and a lot of third-party apps as well. Evidently, the SafetyBox App will also feature navigation based upon a Hamburger Menu. Implementing an Awesome Hamburger Button by Jerry Nixon. XAML Navigation (Windows 10 Universal App Sample) from Microsoft, on GitHub. However, in this article, I will try to present a consolidated approach that makes sense and present the concepts in the order I stumbled upon when trying to implement this menu in my own app. The left part, called the navigation Pane, consisting in the hamburger menu itself. The right part, designed to host a Frame, consisting in any page that the user wants to navigate to. The navigation pane can be invisible, or displayed in Compact or Open mode. The Compact mode typically displays only the hamburger button itself and the navigation options in the form of icons. The Open mode diplays additional text for the navigation options, as well as a richer set of interactive options if the application requires it. A default project for building universal applications create an App.xaml application object as well as a MainPage.xaml page. One of the first task when implementing the Hamburger menu is to change the MainPage.xaml to act as a Shell that provides navigations to other pages. There are several options for laying out the Hamburger menu. One popular option is the one used by most builtin MSN/Live Apps, such as News, Finances, Weather, etc. This is done with the following layout, where you can notice that the Hamburger button is actually not part of the SplitView pane. Another option is to include the Hamburger button inside the SplitView pane. This approach is used by the Groove App, for instance. In this article, I will present a solution for implementing the latter option, similar to the Groove Music App. Another choice to make is how to implement the SplitView pane menu items. I have personally chosen to use RadioButton controls for several reasons. First, conceptually, the options in a SplitView pane can be thought of as a group of mutually exclusive options. Second, it is very easy to apply custom styling to a RadioButton via a redefined control template. Since styling is easy, it is also easy to include support for changing the colors on mouse/pointer hover. Another option would have been to use a ListView control with single selection enabled, for instance. A ListView is a bit more cumbersome to use, however, because have to use a custom class that represent ListView items and use a DataTemplate to apply styling and custom behavior. Also, one has to include special code to support navigating the list with the keyboard without triggering item selection. With that said, let’s dive into the code! First, you may optionally want to rename MainPage.xaml to Shell.xaml. This code uses the otherwise unused Tag property of XAML controls to store the icon associated with a particular option. This icon is designated with a code that maps to the character code using the Windows 10 font named Segoe MDL Assets 2. Two styles are defined in the Generic.xaml file. The second style, named NavigationButtonStyle, is targeting RadioButton controls in the Hamburger menu. This style defines a layout with three columns. From left to right, one finds a) a selection-rectangle that highlights when the particular option is selected, b) an icon and, c) a text, displayed when the SplitView pane is open. This style includes visual triggers using a ColorAnimation to highlight the selection rectangle in blue when the particular option is selected. The first style, named MenuItemButtonStyle, is targeting regular Button controls. In particular, this is the style used by the Hamburger button itself. You will notice that is uses a two-columns layout, with an icon and a text. Notice that the icon’s left margin is adjusted so as to be aligned with icons displayed by the first style. In the next post, I will walk you through adding proper mouse/pointer hover feedback and handling navigation using the keyboard. You may have noticed it’s been a long time since I posted on this blog. As a matter of fact, I have been really busy working on expanding our Middleware as a Service Platform at Moskitos. At the same time, since the unveiling of Windows 10, I have been really excited about Universal Windows apps and wanted to contribute some ideas on this. Although my day to day job is still very much grounded in the fields of Integration and Azure, I would like to primarily focus my interest around building Apps for the Windows 10 Universal Windows Platform on my spare time. To this end, I’m setting up an open-source project on GitHub. The purpose of the SafetyBox App is to be a Universal client for KeePass .kdbx database files. I have been a long time user of the iPhone where one of the best password manager app is AgileBits’ 1Password. Since I recently switched to using a Windows Phone, I figured I’d use a similar app from the store. However, I found the offering to be very poor. I found that the 1Password app only works in read-only mode and is lacking compared to its iOS counterpart. So I switched to using KeePass at the same time. Again, there are a couple of applications in the Store for KeePass, but they are either old or not as feature-rich as I may like them to be. Additionally, I think the user experience for these apps can be improved. That’s why I decided to share my contributions as an open-source project. Since I’m new to building XAML apps – I must have lived on another planet during the Silverlight and Windows 8 eras – I have a a lot to learn!